Michel Germain has launched Sexual Paris Tendre and Sexual Paris Tendre Pour Homme. 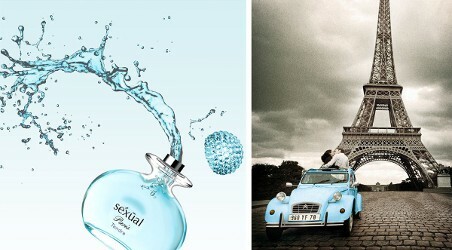 The new fragrances are flankers to 2015's Sexual Paris and Sexual Paris Pour Homme. Sexual Paris Tendre (shown) ~ "The heady, softly intoxicating scent of tender love, Paris style. Romance swirled with essences of gorgeous, tender florals and a caress of Paris’s sumptuous champagne fruits. Paris Tendre. The best memories are yet to come." With ginger, red currant, champagne, mandarin, rose, freesia, violet, orris, amber, musk and sandalwood. Available in 5, 75 or 125 ml Eau de Parfum. Sexual Paris Tendre Pour Homme ~ "Parisian style blended with masculine accords of leather, gently intoxicating Champagne Bergamot, and fresh scents of Star Anise and Juniper Berries create a devastatingly charismatic accord. Sexual Paris Tendre. The best memories are yet to come." Additional notes include white pepper, patchouli, cedar, thyme, musk, leather and vetiver. Available in 8, 75 or 125 ml Eau de Toilette.